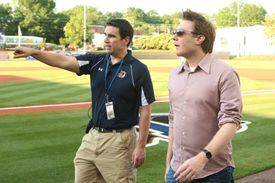 For 13 seasons, Matt DeMargel served as the director of game entertainment and promotions for the Lake Elsinore Storm Professional Baseball Team, USA Baseball and the Durham Bulls Baseball Club. Over that time his show was seen by more that five million fans from all over the world. DeMargel was responsible for the staffing and training of the entertainment team and press box personnel, the selection of audio and video elements, creation of game day scripts, mascot and celebrity appearances, and game day entertainment.